Robert Miller of Arkansas's chapter of the League of the South holds a Confederate battle flag and the LOS flag on Capitol grounds. Former Ku Klux Klan leader and former Louisiana Republican state representative David Duke says the climate is right for him to seek public office once again. Duke, referencing Republican presidential nominee Donald Trump, announced on Friday he's running in the state's U.S. Senate race. The inheritor of Duke's version of the Klan (there are several national groups competing for pre-eminence) now resides in Arkansas. Zinc resident Thomas Robb, who has brought plenty of attention to nearby Harrison, has also praised Trump's candidacy for raising issues near and dear to his cause. One of the state's youngest and most active white supremacist groups, the Arkansas chapter of the Southern nationalist League of the South, is planning for a busy fall as well. While some of these secessionists find much to like about Trump's positions on multiculturalism and trade they're not interested in participating too heavily in the U.S. political system - they'd rather secede. Arkansas League of the South chair R.G. Miller (who works in insurance in Harrison) is organizing the state group's first annual conference September 24th in Conway. The national organization held its conference in Wetumpka, Alabama earlier this month. At this date, those slated to speak include Mark Thomey, a board member of the parent LOS organization; James Edwards, the host of a white supremacist radio show broadcasting near Memphis; and Brad Griffin, the author of a relatively popular "pro-white," Southern nationalist blog. A public demonstration is also planned for the day long event. Miller says a location hasn't yet been nailed down. Finding venues willing to host secessionists and white supremacist groups has been a challenge for the movement elsewhere. The Arkansas branch of the League of the South has held a handful of public demonstrations, dating back to shortly after Dylan Roof killed nine African-Americans in a Charleston, South Carolina church. The League has not expressed support for the killings but sprouted new chapters across the South (including Arkansas) as Confederate imagery came under renewed scrutiny from lawmakers, public figures, and public protests. The national group has existed since 1994. Past LOS activity in Arkansas has largely been confined to sign holding and flag waving events centered around immigration, Muslim refugees, and so-called traditional Christian marriage. In addition to official group events, League of the South members have been active in several so-called flagger and heritage movement events in Arkansas. The conference will be the state chapter's first public attempt to articulate its vision for secession and a white, Christian and Southern identity in a format other than a demonstration. They'll be pursuing the street demonstration route at least once more before the conference in Conway. The group will be counter protesting an LGBTQ pride parade in Harrison on July 30. The Facebook event lays out guidelines meant to craft a presentable image. 1. This is an event that represents not only our organization (The League of the South) but more importantly traditional Christianity. Any trouble makers, rabble rousers, or those who will put a blight on our image to the public will be asked to leave. 2. In order to maintain a respectful and professional appearance, we ask that all participants dress in an appropriate way. Shirts with collars, pants/jeans, and closed toe shoes are reccomended. 3. In order to maintain a consistent message and unity, we ask that no home-made signs be used. We will provide professionally made signs that have a simple, readable message "Support Christian Marriage." 4. We also ask that you limit the flags used to the Confederate Battle Flag or the Southern Nationalist Flag (the black cross). These flags will be provided to all those who need them. The League of the South can also claim a minimal influence in the Arkansas General Assembly. Former Republican State Representative Loy Mauch (2011-2013) of Bismark was once a member of the organization. Though after testifying against an ultimately failed effort to separate the dual state holiday of Martin Luther King, Jr. and Robert E. Lee Day, he said he was no longer a member of the organization. State Representative Nate Bell, an Independent from Mena, helped lead the charge to separate the two holidays. Bell has said League of the South members have left him threatening messages in response. Former State Representative John Burris, currently a healthcare lobbyist, recently wrote in defense of campaigning for Mauch in a major statewide publication. "In 2012, as the former House Republican Leader and then campaign chairman for the caucus, I spent the weekend before the November election going door-to-door in Garland County for Rep. Loy Mauch, a nice man but a Confederate defender. In between doors, I was fielding phone calls defending Rep. Jon Hubbard, despite his idiotic remarks on slavery. I even defended Charlie Fuqua, challenging a friendly Democratic incumbent, who advocated for stoning children for disobedience. All three men lost, as did countless other Republicans we thought would win, probably in part because of bad candidates tarnishing a good brand. But at the time, I defended them all. Not because I believed in them, but because I believed a Republican majority in the Arkansas legislature could do great things. The damage an individual member could do on their own was limited, but the impact of their vote on team objectives was critical. That’s why politics is a team-sport." League members have promised to stay active in any upcoming battles in the legislature intended to reduce the influence and role of Confederate imagery and ideas. Though LOS leader Michael Hill, a former history professor, notes in a recent post that the organization is primarily a future oriented secessionist movement. Lee Stands In Bid To End Arkansas's Dual Lee/MLK Holiday, Rep. Called "Colored"
A second attempt in the Arkansas Legislature to decouple the joint state holiday of Confederate General Robert E. Lee and Martin Luther King Jr. failed in the House State Agencies Committee Wednesday after a tense hearing. “The people who support this bill have been somewhat silent. There is a lot of intimidation up there," said the bill's sponsor Representative Nate Bell. Tens of thousands of Southerners rallied this year in defense of an identity they believe is under assault: a veneration of a Confederate heritage. It’s difficult to parcel through just who comprises this movement but some say extremists within it are finding a voice. KUAR's Jacob Kauffman reports on the ongoing national conversation over Confederate imagery that pervades the South. In recent weeks, the battle over Confederate imagery has focused mainly on a flag, but for some the debate naturally extends to other symbols they see as offensive. As Arkansas, like many Southern states, continues to grapple with emblems of its past, the question arises: To what extent are monuments in public places an issue? National attention over Confederate imagery has subsided in recent weeks but a victory for flag advocates in Arkansas emerged this month and a battle over Little Rock's Confederate Boulevard remains. 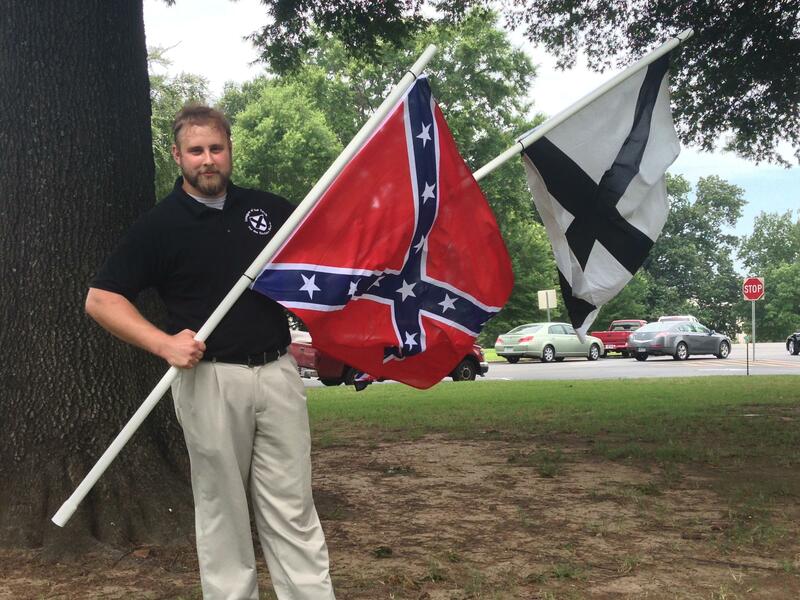 A force behind the successful resurrection of a Confederate-era flag on the Independence Courthouse lawn in Batesville earlier this month is thanking the participation of the secessionist League of the South, which hopes to create a white, Christian nation. Scores of young people made up the bulk of a diverse crowd about 200 on the state Capitol steps on Friday, calling for an end to police violence against African-Americans. The show of support for the Black Lives Matter movement came after the latest round of national incidents involving police officers killing seemingly cooperative young, black men. Organizers under the auspices of Hands Up, Guns Down also unequivocally condemned the killing of police officers in Dallas. Hundreds turned out on the state Capitol lawn Saturday afternoon to rally for and against the US taking Syrian refugees.